Mission Federal ArtWalk presents ArtTALKS, an immersive spoken word experience featuring some of San Diego’s finest poets, writers and lyricists. Many thanks to Gill Sotu, who curated this fantastic lineup. Gil Sotu – He isn’t strictly a poet, a musician, a writer, a DJ or host. Effortlessly combining the artistic elements of himself, Gill weaves poetry into musical performances and improvisational songs into hosting gigs. Ever present is a forceful undercurrent of soulful, comedic, thought-provoking passion that engages and inspires his audiences throughout California. Currently, Gill is a teaching artist with The Old Globe Theatre, as well as the Artist In Residence at Makers Church in San Diego. He has just finished an Artist In Residency at the Jacobs Center for Neighborhood Innovation where he was commissioned to write/direct two full length plays. Gill wrote and performed all the poetic segments to Melissa Adao’s dance theatre showcase, “Hip-Hop CabHooray!” Which won an award for Outstanding Production at the 2015 Fringe Fest. He has opened for Grammy-nominated legend Sheila E, as well as Talib Kweli. Partnered and performed with the San Diego Symphony, has been commissioned to create plays for The Old Globe and CSUSM. Wrote and performed numerous poetry pieces for the United Way of San Diego, San Diego’s Fashion Week, and performed the closing number for TEDx San Diego in 2013 & 2016 as well as hosted TEDx San Diego in 2017. The San Diego community continues to take notice of Gill’s talent and charisma, as he’s been featured on NBC 7’s Art Pulse TV and was named the 2012 & 2013 San Diego Raw Performing Artist of the Year. 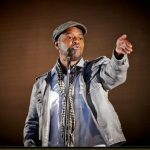 Amidst regular performances, Gill hosts events throughout the county and also conducts poetry workshops in schools across California and has facilitated poetry workshops within San Diego County’s juvenile detention center for over 2 years. He finds the creativity and honesty expressed by these elementary through high school students to be an incredibly rewarding experience and reminder of the importance of speaking one’s own truth. Gill Sotu is a paradigm shifter whose audience feels that he’s speaking to them individually, making a performance to hundreds seem more like an intimate dialogue between close friends. Charismatic and with an ability to adapt to any event,Gill quickly garners people’s attention and doesn’t let go until he says “Thank you”.